This is the workout from hell! It was only recently I re-read the Training Pace Guide and noticed the greater or equal sign. So I have always taken TR pace to be 2k race pace. Or to be precise for a 4x4 I do a race start and then row at mid race pace which ends up at about 0.4s slower than average 2k pace after 4 minutes. With 3 mins rest it is a killer and I'm starting to think it's easier just to do a 2k TT minus the racing finish. If I'm not physically and mentally prepared I'll HD. It's horrible but I also don't know of a better way to really push myself in terms of race preparation. 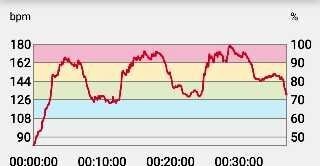 Pace of rower makes a difference here (which is why you need a range). 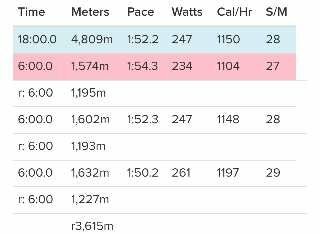 Someone doing a 9 min 2k does 890M per interval, probably achievable at 2k pace, but someone at 6 min 2k would be asked to do 1333M / interval and would do well to complete at 2k + 2! But less of a WO from Hell than 3x6' as shorter and with 1 fewer rest! As said before, no expert on IP, but Ian I would say to start at 2k + 1.5S and see how it goes. Last edited by Iain on Mon Dec 03, 2018 5:39 pm, edited 1 time in total. Well, my stubborn streak obliged me to try it but I shall revert to the more humane rates generated by the link above (and potentially start at week one again for the cv boost). Interesting point about the relative speed (4 mins for me is 1,160m). With the above in mind, I treated today's tr 3x6, 6r as a negative split. Started at a shade under at and aimed for - 2s each rep.
Looks like a great solution well carried out.